Product prices and availability are accurate as of 2019-04-13 23:42:56 BST and are subject to change. Any price and availability information displayed on http://www.amazon.co.uk/ at the time of purchase will apply to the purchase of this product. The perfect gift hamper for any man in your life. Cabernet Sauvignon, Chilli Coated Peanuts, MacAllan whisky marmalade and the delicious Choc Roose Chocolates. 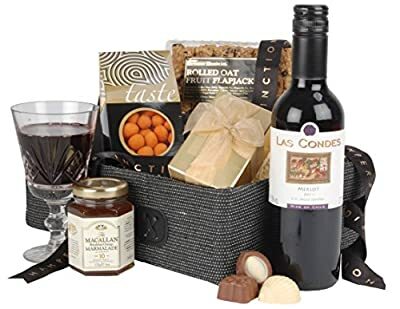 All presented in a blue woven basket making an ideal hamper for a special occasion, celebration or Thank You gift.